Tweet this Offer for a chance to win a free subscription to BJJ Legends Magazine. @BJJLegends will tweet you back ( look for our message in your mentions) and tell you that you are entered for the drawing. Participation in the BJJ Legends Tweet It (the “Sweepstakes”) constitutes your agreement to be bound by these Official Rules. Eligibility: Open only to legal residents of the United States, 18 years of age or older and residing in the United States at the time of entry. Employees, officers, and directors of BJJ Legnends, AIM, Legends Multimedia, Inc., (“Sponsor”) its subsidiaries and its advertising and promotion agencies, and their immediate family members and persons living in their same household, are not eligible to participate in the Sweepstakes. Void outside of the 50 United States and the District of Columbia. Void where prohibited by law. If you do not have a twitter account, go to www.Twitter.com and sign up – it is free. These optional opportunities are not required and participating or not participating will in no affect your ability to enter or win the Sweepstakes. A twitter account, from Twitter.com is required, or an email address is required to enter. Only one entry per household is permitted. Sweepstakes Period: The Sweepstakes begins on Dec 1, 2009 at 5 pm Eastern Time and ends at Feb 1, 2010 or at the discretion of BJJ Legends. 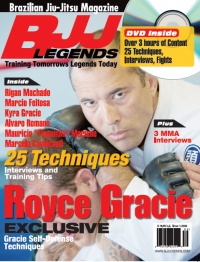 Prize: One winner will receive a BJJ Legends subscription equal to 4 issues, one prize is available. All prizes will be awarded. No alternative prize, cash or other substitution is permitted except in the sole discretion of the Sponsor in the event of prize unavailability. All federal, state and/or local taxes are the sole responsibility of the winner. Selection of Winner/Odds of Winning: Winners will be drawn randomly at the end of the period from all eligible entries received. The drawing will be held on February 2, 2010, or the following day of the ending period if extended. Winners will be posted on www.BJJ Legends.com and notified by twitter or email at Sponsor’s discretion on or before the Friday immediately after each drawing, you are encouraged to visit www.BJJ Legends.com on a weekly basis to keep up with the latest developments. Prospective winners who do not respond within fifteen days after the initial post or contact on www.BJJLegends.com, or attempt at contact are declared ineligible will forfeit their prizes and alternate winners will be selected at random. As a condition to receiving the prize, winners must complete and return an Affidavit of Eligibility, Release of Liability and (except where prohibited) a Publicity Release. Each winner agrees to the use of his or her name, voice and likeness for promotional purposes without further compensation, unless prohibited by law. Winner should allow approximately 3 to 4 weeks after mailing the affidavit of eligibility and publicity release to receive the prize. BJJ Legends will arrange for the subscription to be delivered to the winner’s destination of choice in the Continental United States via freight prepaid with a ground delivery method, the number of days in transit is not guaranteed, and depends on the final destination. The odds of winning a prize depends on the number of eligible entries received. General Conditions: No purchase necessary. . SUBMITTING AN ENTRY CONSTITUTES ENTRANT’S IRREVOCABLE ASSIGNMENT TO SPONSOR OF ANY AND ALL RIGHT, TITLE AND INTEREST (INCLUDING, WITHOUT LIMITATION, ALL COPYRIGHTS) IN THE PHOTO AND BJJ Legends STORY. Sponsor shall have the right, but not the obligation, to attribute the photo or BJJ Legends story to the entrant by name and city and state of residence. Sponsor is not responsible for and shall not be liable for: (i) misdirected or delayed mail or e-mail; (ii) telephone, telecommunications, hardware or third party software malfunctions, failures, or difficulties of any kind; (iii) any condition caused by events beyond Sponsor’s control that may cause the Sweepstakes to be disrupted, corrupted or terminated; (iv) any injuries, losses, or damages of any kind arising in connection with or as a result of participating in the Sweepstakes or possession of the prize; or (iv) any printing or typographical errors in any materials associated with the Sweepstakes. Sponsor reserves the right to disqualify, in its sole discretion, any person tampering with the entry process, the operation of the systems required to conduct the Sweepstakes or operate the Sponsor web site, or who is otherwise in violation of these Official Rules. All issues concerning the construction, validity, interpretation and enforceability of these Official Rules, or the rights and obligations of the participants, shall be determined by Sponsor in its sole discretion and governed by these Official Rules and California law. Rules and Winners List: To obtain a copy of these Official Rules or a winners list, please send your request in writing to: BJJ Legends Tweet It Winners List, PO BOX 2517, Orange, California, 92859. Requests must be received no later than February 15, 2010 .